Join Community Groups to meet peers who live in your city, work in similar roles and industries, and share your interests. Get help, find answers fast, and discuss topics you care about with Salesforce customers and employees from around the world. Gain incredible insight from Salesforce MVPs and Community Group Leaders who love to share expertise and help the community succeed. Share your story, be a mentor, give back to the Trailblazer Community, and bring Salesforce to the communities you love. 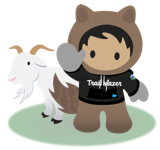 The Trailblazer Community team is here to help you have an amazing community experience! Please join us in the Trailblazer Community Corner Chatter Group.